Designed by architect Arthur E. Thomas and built in 1938 in the iconic Art Moderne Style, the Falls County Courthouse boasts details such as stonework featuring stylized eagles, symmetrical organically-derived ornament on the spandrels, and geometric motifs on some pilasters. A three-story central tower accentuates its symmetrical façade, and the interiors feature massive shell stone entry surrounds, 3-color marble floors, marble borders and base, aluminum handrails along the main staircase, and geometric patterns all typical of the Moderne style. The restoration of the Falls County Courthouse would provide a critical infusion of capital into the county seat of Marlin, which boasts a rich variety of institutional, commercial and residential architecture from the early 20th century. Grant funding from the Texas Historic Courthouse Restoration Program is essential for this project and for the restoration of seventy five other historic courthouses that are in need of financial support. 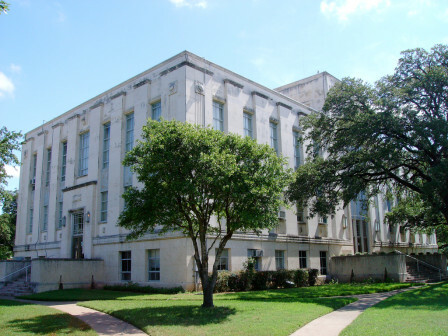 The restoration of county courthouses has been demonstrated to stimulate preservation activities in courthouse towns, while renewing irreplacable architectural landmarks throughout Texas.